Samus has been hired to investigate MockingBird Station. Others have come before her, but none of them have returned. Upon arrival the station sealed the hanger doors blocking her way out. 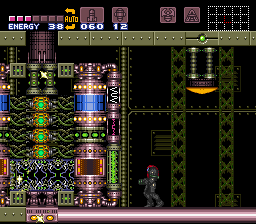 After scanning her systems, Samus finds that she must disable the stations power generator before she can leave. Unfortunately the most direct route to the generator has been blocked and she must take a more roundabout path. The only thing that she knows is that much of the station is in lock down and she will need to release bulkheads to open more of the station. A larger bulkhead in engineering is blocking the alternate route. Disabling the generator will destroy the station, but there is no other option. Mockingbird station is an interesting concept thrown inside a blender of spikes and pain. The hack is very unforgiving, but at the same time, relatively enjoyable. Having to find doorcaps and open them to advance in other parts of the station is a really interesting idea, and it is pulled off relatively well. Traversing the area is a big hassle in a lot of cases and can be a major cause of concern. 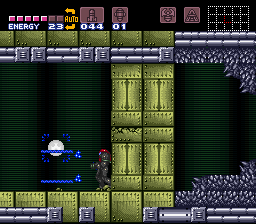 There are also a lot of spikes, plenty of ways to die, and cleverly hidden secrets which can kill the player as well. This is not going to be everyone's cup of tea, but you could do far worse than Mockingbird Station if you're looking for a relatively short and challenging hack. This is actually two hacks in one. Mockingbird Station & Get The Grapple. Feels forced linear. Worst phantoon fight. Get the grapple isn't happening. One really sick speedboost puzzle during the escape sequence. Kinda wana mockball & bounce, best part of the hack imo. Ten hours rta, not a fun day, damn turtles are stupid. Easy four stars if it gets finished with spore spawn & power bombz though. Oh yeah, thanks for the hack. Love the background level designs of the depths of the engineering room. Sound selection gives the station an eerie vibe even though it is well lit. A few issues, and other things worth mentioning but dont want to give out spoilers. I do wish there was a more thorough background or synospsis on this hack, and a map. Because without these suggestions, I did need a lot of youtube to follow to make it through the hack. That was not the case with other hacks.